Matt Hite is a life-long waterman, instructor, EMT, and trainer from a family of lifeguards and surfers. He has been involved in the SUP industry since 2008 and has leveraged his experience and expertise to become one of the most respected and premier SUP instructor trainer and coach in the sport. 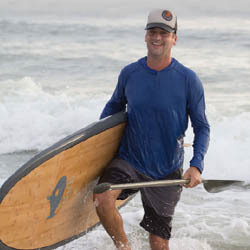 Matt is amped to share his passion for SUP, safety, and knowledge of the ocean. Todd Bishop has over 27+ years combined (Paddleboard/Surf/Kayak/Canoe) experience in several Central American countries, Caribbean islands, and other US waterways. His passion and devotion to education, people, and the ocean is contagious and impactful. Besides developing his own paddle board product line, he has been involved within the development many paddlesports businesses and instruction programs. Julie Roach is an experienced yoga practitioner, instructor, and trainer both on and off the water. Her dedication over the past 15 years to yoga and sup yoga has established her expertise in the industry. She has been recognized as one of the early pioneers of SUP Yoga and created H2YO SUP Yoga & Fitness in 2009. Julie is commitment to safety and empowering anyone and everyone to an incredible experience on the water. Contact us! Your next SUP Adventure is waiting!